At the center of those plans are large undeveloped parcels that are prime for new developments. This year Grapevine city officials are continuing to place an emphasis on attracting development to the city’s last and biggest commercial parcel, a 185-acre tract located near Grapevine Mills. Although the city of Colleyville has very few large tracts left, there is a little more than 60 acres at the entrance of the city where city officials hope to build a northern gateway that contains new commercial development. 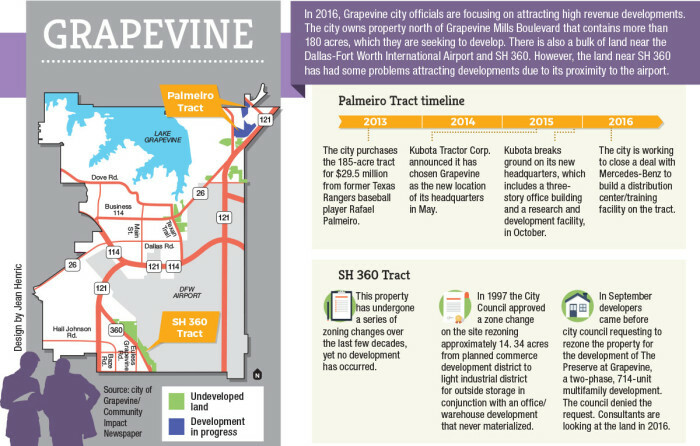 With about 85 percent of the city of Southlake built out, there is not much land left in the city to develop. However, the city does have a bulk of developer-owned land along SH 114 and in Southlake Town Square that could see development this year. A prime opportunity to guide the future economic development in the city can be found on the tract of land dubbed the Palmeiro Tract as it was purchased by the city from former Texas Rangers baseball player Rafael Palmeiro in 2013. Mayor William D. Tate said the tract was purchased to create and attract businesses that will pay the most revenue to the city in terms of taxes. In 2015 the city was able to complete a deal with Kubota Tractor Corp. to relocate its headquarters from California to the tract of land. Tate said the city could see another deal for the Palmeiro Tract completed with Mercedes-Benz for a distribution/training facility early this year. Grapevine Economic Development Director Bob Farley said the city is currently being looked at by four 300-room hotels. He said it is possible that each of the hotels come to the city. The city also has undeveloped land near the Dallas-Fort Worth International Airport and along SH 360 that could see some development this year. However, Tate said with those tracts being close to the airport they have had a hard time getting developed. Tate said the consultant will have an analysis ready sometime early this year. 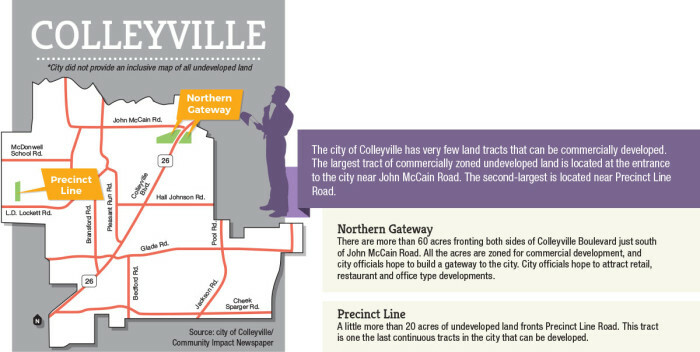 Colleyville has few land tracts left in the city that can be commercially developed, as most of the undeveloped tracts are privately owned or zoned for other uses. Colleyville Economic Development Director Marty Wieder said the city seeks to bring a mix of shopping and dining options to those tracts. Although the city will see new development, Kelly said city staff will work to make sure the rural feel of the city is maintained. There may not be much undeveloped land left, but Wieder said there is a possibility of some redevelopment this year. In the past years the city has been successful in redeveloping vacant buildings into large retailers, such as Whole Foods Market and Wal-Mart. Southlake Mayor Laura Hill said in 2015, the city of Southlake continued on its path of attracting quality commercial developments. Ken Baker, Southlake senior director of planning and development services, said as of March, the city has about 15 percent of its land left undeveloped, but a number of properties have the potential of redevelopment. As far as undeveloped land, Baker said most of it is along SH 114. Hill has created a committee to help guide development along the SH 114 corridor. She said she created the committee, which council members Brandon Bledsoe and Gary Fawks sit on along with residents and planning and zoning commission members, because of the need to plan on a larger-scale level. Going into 2016 Hill said she is confident the undeveloped land on the SH 114 corridor will attract more quality development projects.